A 1927 pictoral map with all the dominions and trade routes. British Empire Marketing Board. Library and Archives Canada, Acc. No. 1983-27-382 Copyright expired. 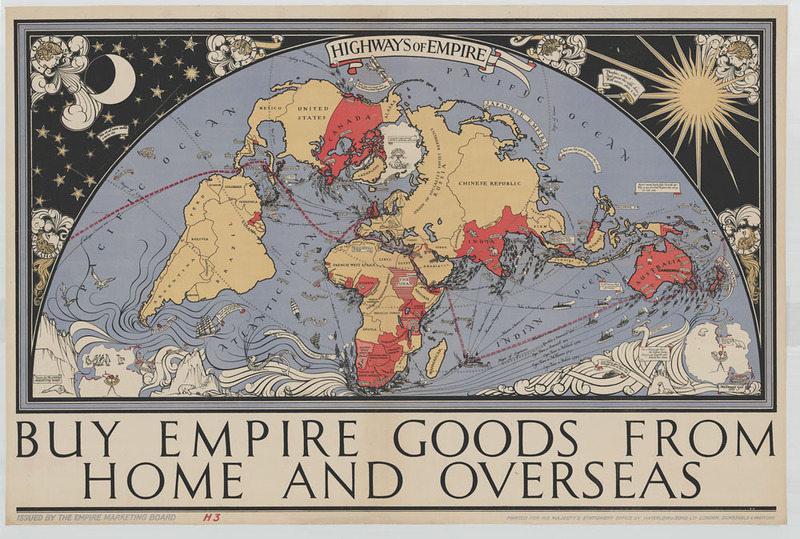 The History Department at the University of Exeter has recently received funding from the AHRC to support an international research network: ‘Imagining Markets: Conceptions of Empire/Commonwealth, Europe and China in Britain’s economic future since the 1870s’. The network led by David Thackeray, Richard Toye and Andrew Thompson aims to provide a bridge between historical and contemporary ways of thinking about Britain’s future global economic orientation, bringing together scholars working in the fields of Imperial, European and Asian studies, and scholars from cultural studies and economic studies, which have become increasingly separated branches of enquiry calling for reintegration. Working with and through a range of public policy intermediaries including History and Policy, the Churchill Archives Centre and the Institute of Commonwealth Studies this project will provide policy-makers with an inter-disciplinary analysis of the long-term development of British overseas trade, which in turn will illuminate the diversity of cultural values and political perspectives that have, and continue to be, brought to bear in growing exports to key markets. In the wake of the recent global financial crisis, the question of how nations can establish, protect or even recover a competitive economic advantage looms large in media, manufacturing, business and policy-making circles. As an exercise in the development of long-term historical perspectives, the network will generate fresh insights into the ways in which perceptions of international markets were reconfigured as a result of intra-European trade agreements, acquisition of territory/concessions in Africa and China, and growing demand in Britain for protectionist tariffs arising from intensifying industrial competition from Germany and the United States. It will further explore the extent to and ways in which Britain’s economic relationships with the Commonwealth, Europe and China remain vital to its identity in today’s globalised world. Events over the next two years will a series of research workshops to be held in Exeter, London and Cambridge focusing on these three key markets, bringing together scholars working in Economics, English, History, Human Geography, International Business, International Relations and Media and Cultural Studies. Furthermore, we will hold a policy seminar in London exploring the implications of the project’s findings for our understandings of Britain’s networks of trade and investment with the Commonwealth. Public policy perspectives from the recent past will be fed into the final Cambridge workshop via a witness seminar, and research findings will be explored via a series of postgraduate events and public policy papers. We look forward to keeping you updated on our progress over the next two years! Previous A Scottish Referendum on the Failed Empire? For the next few years, the University of Exeter will be the hub of an exciting scholarly network called “Imagining Markets: Conceptions of Empire/Commonwealth, Europe and China in Britain’s economic future since the 1870s.” The network will be led by David Thackeray, Richard Toye and Andrew Thompson. The goal is to provide a bridge between historical and contemporary ways of thinking about Britain’s future global economic orientation, bringing together scholars working in the fields of Imperial, European and Asian studies, and scholars from cultural studies and economic studies. Sounds like a great initiative. They are going to be sponsoring a new of conferences. I certainly have a number of papers relevant to the overall theme that I could present.